In stock - low quantity. Order in the next 6 hours, 4 minutes and it will go out today! 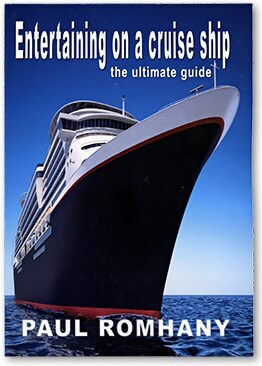 The most comprehensive book ever produced for entertainers who want to work in the cruise ship industry. No stone is left unturned as Paul shares the inside secrets in to becoming a guest entertainer on board a high-end luxury cruise liner, and all the inside information you will need to secure an amazing job like this. Learn how to go about working in the cruise industry, life on board a ship, what to expect, how much money you can earn, how to get your DVD in front of the right agent or cruise line, and a bonus chapter of some of Paul's pet magic routines from his act. Learn facts about ships and ship life and details about day-to-day life as a Guest Entertainer on a ship (the good times ... and the not-so-good times). Plus, in a further effort to share the richness that a career in cruise ship entertainment might offer, Romhany has included beautiful photos from around the world, and even excerpts from his very own personal journal --which draw the reader into this fascinating world and illustrates the author's very own life on board ship in ways which most other authors might not be willing (able) to share. Included are up-to-date web addresses, a glossary of ship terms and cruise ship contact information that will surely accelerate the learning curve for those that have the true spark, desire, and talent to pursue launching their career as a successful cruise ship entertainer. For more seasoned entertainers, this guide should also prove both interesting and informative. This 270 page book is also packed full of photographs and stories from Paul's career as one of the most sought after cruise ship magicians, giving you a true insight in to the real world of this type of work. The book is also interlaced with stories and advice from other veteran cruise line entertainers and valuable lessons they have learned. "The information in this book is worth thousands of dollars to ANYBODY wanting to perform on cruise ships...I wish I had this book when I was trying to get in to the cruise ship industry!" - Den West, Cruise ship entertainer. "Every magician knows that great feeling they get when they buy a magic dvd or book and find a piece of advice or a new effect which enhances their show - that piece of gold that we all look for. Every page of Paul's book has wonderful golden moments in it. Thanks Paul for sharing your secrets of success with us." Jim Gray - purchased this book and is now working on cruise ships!